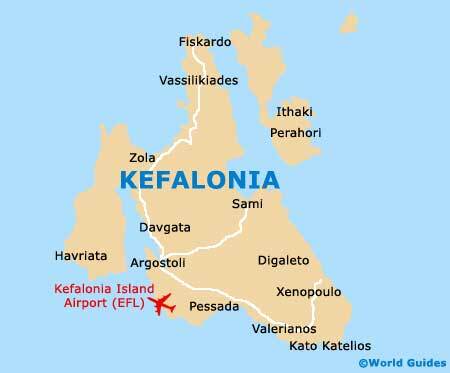 Being a popular Greek island and major holiday destination in its own right, Kefalonia understandably comes with more than its fair share of good restaurants and traditional Greek tavernas. Other dining opportunities around Kefalonia come in the form of 'psistaria' (specialising in char-grilled food or spit-roasts), and 'estiatoria' (a more sophisticate restaurant than a simply taverna), along with various pizzerias, creperies and of course, Greek 'gelaterias', which sell a rather unmistakable Italian-style ice cream. 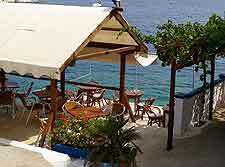 When dining out on Kefalonia, Greeks do believe that a good meal should be accompanied by alcohol. Therefore, some bars, such as 'ouzerias', will often serve small plates of appetizers (mezedes), which may simply consists of olives, Feta cheese and pickles. Restaurants may also serve mezedes, to get your juices flowing before you tuck into your main meal. There are a number of local specialities served at Kefalonia's restaurants, with its hearty meat pie appearing on many menus. Many pies have a thick crusts and are stuffed with meat, rice and vegetables, or even seafood, such as fish and octopus or squid. Other island dining options include 'bourbourelia' - a simple bean soup, 'aliada' - a mixture of garlic, octopus and potatoes, and 'riganada' - bread with oregano and olive oil. 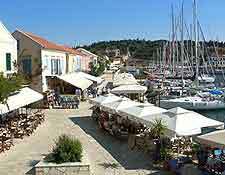 For the best selection of restaurants on Kefalonia, start by exploring the central streets of Argostoli. There are a large number of cafes and similar eateries surrounding central squares in Argostoli, such as the Plateia Valianou, although they do seem to charge a little extra for the sheer convenient of their location. Bar-hopping around the Plateia Valianou is a great way to spend a night of Kefalonia, and the crowds gather here until late. 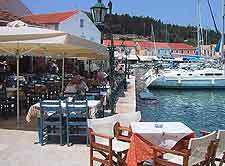 Alternatively, head outside of Argostoli and consider dining in one of the neighbouring villages on Kefalonia, such as Troianata, where self-caterers will enjoy perusing the waterfront market. Some 25 km / 16 miles to the north-east of Argostoli, Sami is known on Kefalonia for its endless strip of 'touristy' cafes and restaurants, with dining venues generally being just a short stroll from Paradise Beach.